Our first view of Helsinki from the ferry. Hit the ground bicycling when we arrived in Helsinki, quickly checking into the renovated prison-turned-hotel, located in a lovely neighborhood of south-east Helsinki, the Hotel Katajanokka. We were scheduled to go on a group tour at 2PM with bikes rented from Bike Helsinki, and led by their partner business, Happy Tours. Got there right at 2, and as it turns out, there were only four of us including a Scotsman named Dan Wynn, and our guide Jeff. So we were suited up with the bikes we would use for the three days of our stay in Helsinki, and were off. 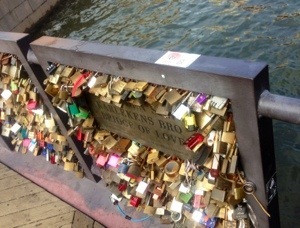 The oddest thing about our tour of the city was one of our first stops: a “love bridge.” These locks all represent declarations of true love between couples, and presumably, their connection will last as long as the locks on the bridge are secure. It appears to be an informal betrothal or security of attachment — if a beloved is ready to place a lock on the bridge and throw the key into the water, one can be assured of his/her commitment. We saw many other sites, statues, and buildings. Jeff, a Canadian by birth, told us excellent stories of the history of the city, the culture of the neighborhoods, and the people behind public art, statuary, and architecture. Dan, from Edinburgh, was combining business with vacation, as he helps run a think tank that brings to Scotland speakers from the Scandinavian countries, who discuss energy sustainability, community solution-finding, social equity systems, and other approaches to work, housing, and neighborhood development for which the Nordic regions are known. So, many of our discussions along the way were about issues such as immigration, community, affordable housing, and energy efficiency. It was quite fascinating. We enjoyed our new friends so much that we continued the camaraderie at the pub near both the bike shop, where Dan turned in his day-rental just before closing at 7PM (Bike Helsinki), which is itself near our jail-hotel. The comfy pub was called Poseidon, and we had the great good fortune to have Stellhagen Brewery’s (from our stay on Åland) ale on draft. Near our seats, and listening to our discussion in English was Tim, another Briton from the London area, and he joined us after his pub grub meal, for another pint — our final of the evening. 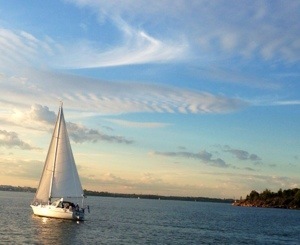 We had our second day in Helsinki to ourselves, and so we set out on a bike tour of the southern coast. Along the map, it was a suggested bike trail, and Jeff had highlighted it as a good ride. We had some complications along the way deciphering the road names (all signage is in both Finnish and Swedish, and depending on the neighborhood or region, one might find either one on top, but in either case, we couldn’t tell the difference, and still don’t know what language our map was in, so we managed a missed path or two along the way). It was a delightful ride, however, with spectacular weather and some good sights along the way, and where did we have to be anyway? So we set out around 10 AM, and rolled back to a wonderful market that Jeff had shown us, and purchased our dinner. We ate in the back courtyard of the hotel, which had been the prison’s exercise yard. 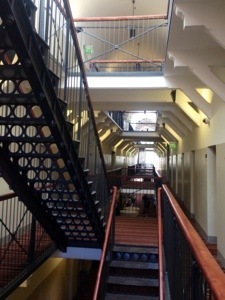 The Hotel Katajanokka has been renovated to preserve much of the look and feel of the building’s original use as a prison. Guests stay in rooms that were the cells for the mostly remanded and political prisoners. So we had logged 5 hours in the saddle on Day 1, 7 hours on Day 2, and we got on the bikes at 8AM on Day 3 for an all-day excursion to the island of Porvoo, in the eastern border of Helsinki, considerably north of our starting point. Kerri, the principal behind Happy Tours, was our guide, and again, we had a delightful day of riding and story-sharing. By the end, we felt as if we’d made another great new friend. The goal was to cover about 50km to get significantly outside of Helsinki, spend a couple of hours on the tourist destination of Porvoo, where we had lunch, and then be on time for the 4 o’clock bike ferry back to the port just alongside our hotel. Several stops along the way, including one of the oldest churches in Helsinki, one of the only practice ski jumps in the region (only 70 meters, where regulation is a min. of 90, max. of 120), and the best candy shop in Porvoo, at which we bought some of their famous truffles. Kerri took home a bag of the famous candies for his wife, a favored (and expected) gift whenever he visits Porvoo. 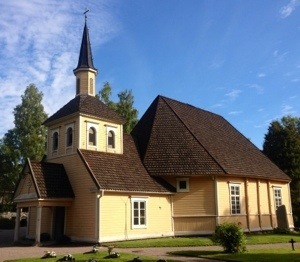 Östersundom Church (Itäsalmi in Finnish), built in the latter half of the 17th century. The 3-hour ferry ride back to Helsinki as the sun sank in the western sky was an irresistible photo opportunity, and I took many pix with the main camera. I tried to be judicious with the iPhone, but still, there are many more photos of all three of our Helsinki days not posted on this blog entry, that you can find HERE.